Couples who seek a vacation full of relaxation and exploration will enjoy an Antigua honeymoon. An Antigua honeymoon is a great choice for couples hoping to spend their trip on a Caribbean island. Lovely Antigua is one of the two small islands that make up the Caribbean nation known as Antigua and Barbuda. The island is known for its sandy beaches, rimmed with coral reefs. You may be surprised to hear distinct British accents on the island, just one of the remnants of Antigua’s colonial past. 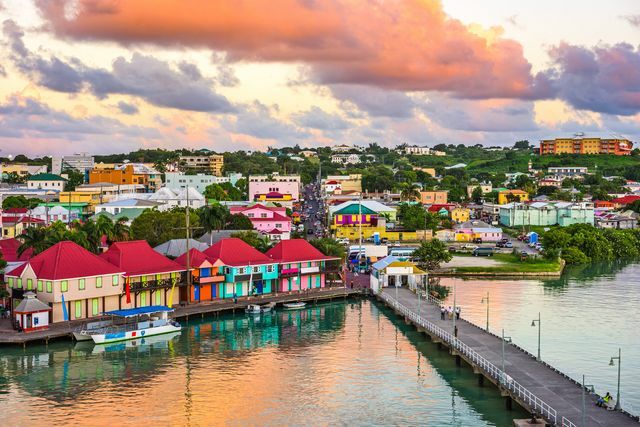 The towns are a mix of colorful Caribbean style and stately European architecture. If you're interested during your Antigua honeymoon, you can learn more about the island’s history at its museums and historic sites. If you are more inclined to explore the great outdoors, you’ll also find mountains for exploring, and of course miles of beaches with ample opportunities for snorkeling and swimming. However, we certainly wouldn’t blame you if you never left your beach towel. Choose an Antigua honeymoon to spend your days relaxing on the beach and exploring colonial history on this dreamy Caribbean island. The weather in Antigua is around 80 degrees year round. The most popular time for Antigua honeymoons is from December to April but prices are higher and you’ll certainly deal with crowds. May to November is cheaper, and with less crowds but there is a slight risk of hurricanes. Nelson’s Dockyard: A cultural heritage site from the 18-19th centuries with a naval history museum and a variety of restored buildings. It's a great attraction if you're looking to learn about the island's history while on your Antigua honeymoon. Museum of Antigua and Barbuda: A museum of Arawak and colonial history housed in the island’s colonial courthouse and oldest building. Fort James: An 18th century British fort which was built go guard St. John’s harbour and sits at its entrance. Mount Obama: The island's highest point, located in the Sherkerley Mountains with steep hiking and 4x4 trails and great views. Shirley Heights: A historic military complex and restored gun battery that offers views of the harbor and a cafe. Dickerson Bay: A stretch of beachfront with a number of large resort hotels, white sand and calm seas. Betty’s Hope: A historic sugarcane plantation with some restored and original buildings that is operated as an open-air museum. Galleon Beach: A quiet, scenic beach in English Harbor that is notable for its snorkeling opportunities and frequent turtle sightings. Stingray City Antigua: A company offering guided snorkeling and swimming opportunities with southern stingrays. Prickly Pear Island: A small island located off of Antigua’s north shore popular for its beaches and snorkeling opportunities. King’s Casino: A long-running casino with table games, slot machines and a sports lounge featuring live music and entertainment—ideal for Antigua honeymooners who love the nightlife. Antigua Rainforest Canopy Tour: An adventure company offering zip lining and rope challenge courses on Antigua’s southwest coast.